Another hour or so of fun tonight. The other day I had some startup problems getting MikroBasic to interface with the LCD libraries. I chalked it up to me being new with the tool. I pinged my buddy Mike in Hartford to see if he could give me a code fragment to test my LCD. Part of my initial challenge was that most of the examples that I was looking at were for 16F877 and I am working with a 16F628A. Trying to figure out code + the difference in chips + a development tool was bit much. Mike sent me some code today and then I translated the pin layout of his system with a 16F877 to my 16F628A demo board. (I am using a PIC-EL III for this exercise.) I then had an issue with the MikroBasic libraries not playing properly again. I ended up refreshing the libraries and that solved my problem. After playing with Mike's code I started to adapt it a bit to get a feel for how to work with it. My final project for tonight is 37 lines long with spaces and comments. I am pretty excited about this. I am going to need to bond with my development platform a bit before I am fully comfortable with it. 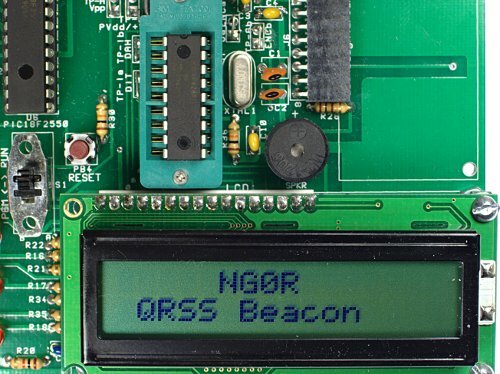 It is looking like a reasonable tool for developing my QRSS beacon keyer with. Development: Ubuntu 10.4 64bit running MikroBasic under WINE.